Defender Uwe Hunemeier admits his Brighton future is up in the air when his contract runs out at the end of the season. The 32-year-old has made 35 appearances for the Seagulls since joining from Paderborn in August, 2015, but has found first-team opportunities limited this season. The German centre-half has played just five matches and only 17 minutes of Premier League action. Hunemeier admits he wants more game time and with his children living in Germany, he says he will have a decision to make on where his future lies come the end of the season: "It will probably depend on the next few months. I have already been in touch with the club a little bit and I think they're still quite happy with me here. "Even in training, I'm still a leader. When I'm not playing, I don't drop my intensity of training or my way of supporting other players but I feel I'm too fit to carry on just being in and around (the squad), on the bench, or in the stands so we will have to see how the situation develops until the end of the season. "I'm out of contract but right now I'm more focused on how we're going to finish the season and then we will sort my own situation out." Asked if he would want to continue playing in England, Hunemeier said:"Right now, it's hard to say. My kids are still in Germany and living away from them for nearly three years is not easy, so there are a few things I need to think about in the next few months and then I need to make a decision. "It depends always on options. I'm going to speak to the club first and I think they're still quite happy with me but I need to make a decision." 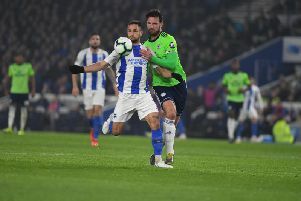 Hunemeier played 11 Championship matches at the end of last season to help Albion clinch promotion, after a frustrating nine months on the sidelines with a groin injury. He said: "For me it was really important to get back to my best. "I stepped in last year and played a game against Brentford and didn't play really well but it was my first game in a long time. Then in the most important time of the year Shane (Duffy) got injured, I had to step in and everybody was probably questioning 'is he ready for that, he hasn't played for a while'. "The most pleasing thing for me was to perform at that time with that pressure and to help the team get promoted. "That gave me a big boost for my personal view because I proved to myself I'm still capable of performing at that level. Now you want to play more and more but we're at the highest level, the Premier League is the highest level you can achieve as a footballer. "I never dreamed of getting to that level, so you have to find the balance between ambition and being realistic because I was never playing at the highest level. "I just played one year in the Bundesliga because I got promoted with a second league team. That was the same with Brighton but even in England there's more money around, so they're looking to get more players in and to strengthen the team. "That was a bit unfortunate for me but that's the time right now in England. I'm still happy to be here and I'm not far off the team. "The club got promoted and the same time, I slipped down a little bit in the pecking order. "It wasn't easy but first of all I'm a team player. Of course I want to play but the success of the team is my main priority. "As a footballer you want to play as much as you can but I'm professional enough to carry on and try to push myself in training as much as I can because first of all I'm a team player and I want to stay up in the league. "And it's not about me if I'm playing, so I want to push the boys to their highest level to stay up in the league. Whenever the gaffer needs me, I want to perform. "The question for me probably is how long you want to do that, just sit out and wait for your chance."